MIAMI BEACH, Fla. - Four men surrendered to authorities Tuesday, two days after they attacked a gay couple following the Miami Beach Gay Pride Parade, police said. Miami Beach police said each suspect faces felony charges. They were identified as Juan C. Lopez, Adonis Diaz, Pablo Romo-Figueroa, all 21, and Luis Alonso-Piovet, 20. Police said the state attorney's office will decide whether the men will face a "hate-crime" enhancement in addition to the existing charges. "That makes me happy that, at least, they were nice enough to admit that they committed the crimes," said Dimitri Lugonov, one of the victims. 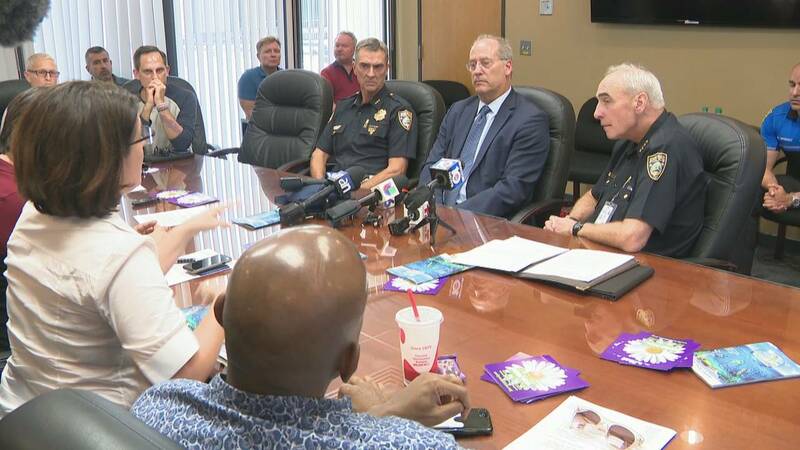 The arrests came after Miami Beach officials met with LGBT leaders Tuesday about the attack. "We celebrate Pride because, frankly, it's important to us that people know that this is a city that believes in diversity and embraces inclusivity," Miami Beach Mayor Dan Gelber said. Lugonov and Rene Chalarca told police they were attacked by a group of men after they shared a hug while waiting to use a restroom at Lumus Park in the 500 block of Ocean Drive. Chalarca and Lugonov said one of their attackers yelled an offensive Spanish word for homosexuals before hitting them several times. "I fell on the ground and somebody started beating me up. I didn't even see the faces," Logunov said. "It was that quick. He tried to protect me." "He hit him, and then I grabbed the guy, and he was already on the floor, and the other people came and started hitting him," Chalarca said. According to a police report, a bystander who saw the attack and tried to intervene was pushed to the ground and suffered a cut to the back of his head. "We confronted the guys and asked them, 'What the hell? Why did you guys do that? That's unfair.' And that's all I remember," Helmut Estrada said. Police said Chalarca and Lugonov had cuts and bruises on their faces and were treated by paramedics at the scene. Estrada was taken to Mount Sinai Medical Center for treatment. Chalarca and Lugonov believe they were targeted because they are gay. "We were together. So for me, it's like, yes, it was a hate crime," Chalarca said. Police said surveillance cameras recorded the suspects as they left the scene of the attack. One of the men was wearing a Florida International University T-shirt, leading the university to release a statement about the attack. "FIU stands for tolerance, diversity and inclusion," the statement read. "The alleged actions of these individuals do not represent FIU values."